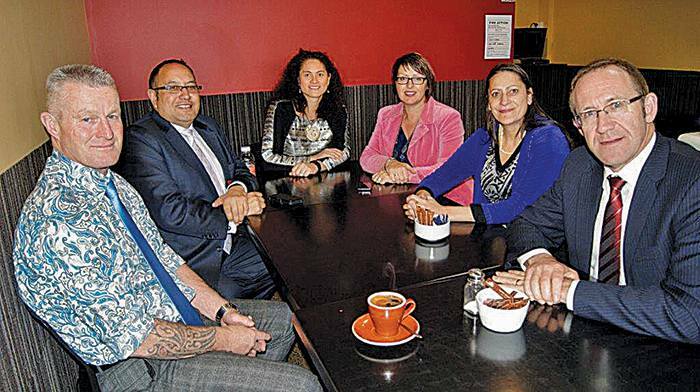 Andrew Little was accompanied by Christchurch MP Poto Williams, spokesperson for the community and voluntary sector, Manurewa MP Louisa Wall, spokesperson for Youth Affairs, Adrian Rurawhe MP for Te Tai Hauāuru. The visit was organised by Penny Gaylor, chair of the Ōtaki branch of the Labour Party. The day started at Ōtaki College, where the Labour team learned about the new e-learning project. Little commented that they were seeing Ōtaki through the eyes of the youth. The focus was on showing the Labour MPs the education and employment choices and opportunities available in Ōtaki. Students gave presentations on the E-Learning approach being rolled out across Ōtaki schools and College’s new careers centre. 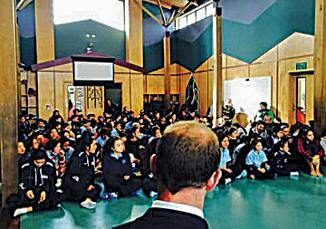 Then on to te Kura a iwi o Whakatupuranga in Tasman Road, for an assembly. They completed the afternoon by visiting Watsons Gardens in Bell Street, who will produce 30 million plants this year, where Don Watson presented Andrew with a cyclamen and Penny talked about Ōtaki as a powerhouse of food, floriculture and horticulture. In the evening, the team were joined by an old friend, Deputy Leader Annette King, well-remembered by applause as MP for Ōtaki in days gone by. Applause was also to Iain Lees-Galloway, MP for Palmerston North, for his work in saving the Capital Connection. Andrew Little addressed a packed Ōtaki College hall to deliver the Margaret Long Memorial speech. As Penny commented in her welcoming speech, the day in Ōtaki had been an appropriate entrée to the evening’s focus about pay equity and social justice — given that “Ōtaki was growing and nurturing tomorrow’s employees, entrepreneurs and leaders”. Margaret Long, long-time Ōtaki resident died this year, aged 88. Her daughter Miriam introduced Andrew Little, remembering that they had both studied Law at Victoria Uni together. Margaret was remembered by Andrew Little as an activist who spent her life making other people’s lives better. She was he said, ‘a public servant in the best sense of the word.’ He spoke of Margaret the teacher, the fighter for pay equity, the PSA stalwart, and her outstanding service to the community. Developing Margaret’s stance on pay equity, Andrew Little quoted statistics to show NZ’s position: – Under the National government, NZ has dropped from 7th to 13th in the world in terms of closing the pay gap, according to the World Economic Forum’s annual report. The Human Rights Commission in 2012 showed that 21 government departments had a gender pay gap higher than the average. according to the ANZ, NZ women are likely to retire with $60,000 less than men, based on current savings patterns. “That’s why Labour believes we need to raise the minimum wage and extend parental leave to give women more support to stay in paid work while giving them more time to spend those precious early months focussed on their baby if that is what they choose to do” he said. “We are continuing Margaret’s fight today. The question that must be resolved is this: if a man and woman do work of equal value, but in different roles — is it right for a man to be paid more than a woman? This has been an area our current government has been loathe to address. From the strength in depth of the Labour Party presence, and the power of their message, it’s obvious that Labour are intent on winning back Ōtaki at the next election. Look to your laurels, Nathan Guy!